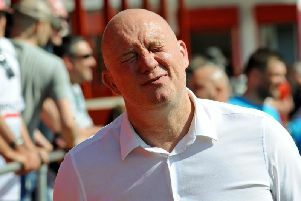 Alfreton Town have announced that former Halifax Town boss Billy Heath will be their new manager. Heath, who has also managed at North Ferriby United, Bridlington Town and Frickley Athletic, will work alongside assistant Mark Carroll having replaced Chris Moyses who left the Impact Arena at the end of the campaign. Heath guided North Ferriby to two promotions, the first from the Evo-Stik Northern Premier League in the 2012-13 season; Billy oversaw the Villagers' FA Trophy success in the 2014-15 season after a 3-3 draw in normal time against Wrexham. Ferriby prevailed on penalties. Heath won his second promotion which came in the 2015-16 campaign as North Ferriby beat AFC Fylde 2-1 in extra-time in the play-off final, which secured a place in the National League. He then made the switch to Halifax Town ahead of the 2016/17 season and guided the Shaymen to promotion back to the National League after a 2-1 extra-time win over Chorley in the play-off final. He told the Reds' official website: “Alfreton has always been a good club, I’ve known Wayne Bradley for a long time and there has always been a good feel to Alfreton when I’ve brought teams here. It’s very well run and the club has been successful in the past when they were in the Conference and it’s an exciting project here. “There was big expectations last season for the Club and as an outsider looking in, I thought Alfreton should have been higher up the table but It’s important for us to prepare during the summer. Pre-season is paramount at any football club and you can imagine it’s hectic now!